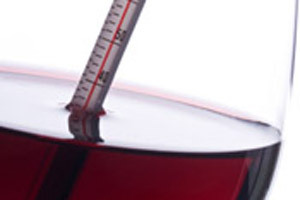 Each type of wine has its own optimal tasting temperature. The French term "Chambrer" is no longer used to indicate bringing to room temperature, because in modern apartments, the thermometer often displays 21 to 24 degrees in winter whereas in the past the temperature did not exceed 17-18 degrees in dining rooms. White wines need to be cooled. Cooling does not mean " freezing ". At a temperature lower to 6 degrees, we are below the level of perception. Cooling also means that temperature must be lowered progressively. The bottle is plunged in a bucket half full of water and a few ice cubes are added. In the glass, the wine quickly gains one or two supplementary degrees. Dry wines, best enjoyed well-chilled (8ºC). More complex whites, with dry yet assertive character, will be appreciated between 10 and 12ºC. As for the rich, fatty and mellow whites, they can bear 13 or 14ºC in the glass. By definition young wines that are required to be fresh and fruity. To be served at the temperature of a good cellar, that is 9-10ºC. Light wines, drank early or very young at 9-10ºC. Reds having better structure bear one or two degrees more when they are drunk adolescent (3-14ºC).<br>Great wines will be served at 15 or 16ºC while the richest in tannin will reach 16 to 18 degrees, the superior boundary (18ºC) being more appropriate for the oldest wines.